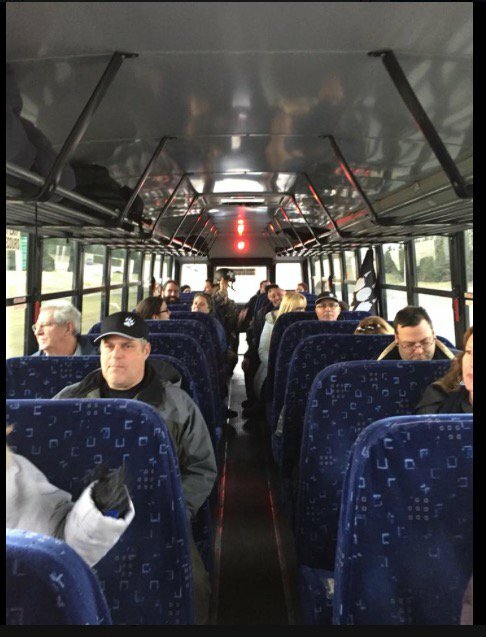 Storm Alliance and the III% Militia, with pepper spray and ASP telescopic Baton ready for action. Atalante showing up behind the antiracists with a response from militants. Police line protecting the Far-right, in front of antiracists who had Atalante at their back. Police gearing up, using pepper spray against antiracists without any provocations on their part. Quebec Police Force making preventive arrests": in front of Liberal Party Convention. 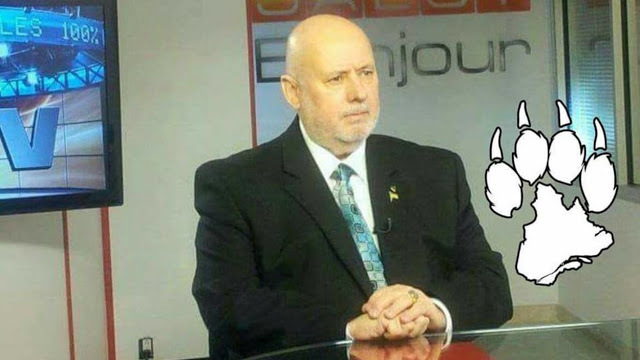 Claude Patry, former MP of Bloc Quebecois, resigned as chief of La Meute in Saguenay, QC. 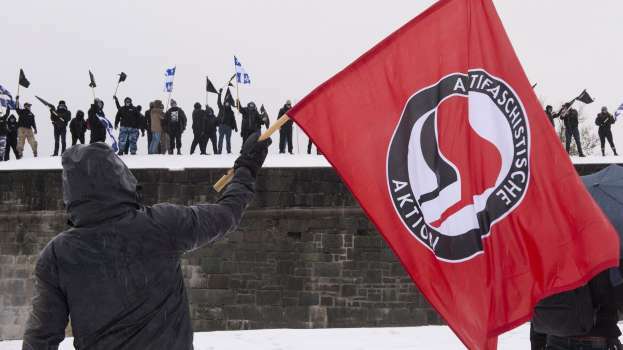 Quebec's largest far-right groups are staging a demonstration today in the provincial capital, where police are working to keep them apart from a counter-demonstration by anti-racism and anti-capitalism activists. Around 300 members of far-right groups, including La Meute and Storm Alliance, marched towards a convention centre where the governing Quebec Liberals are holding a major policy meeting. 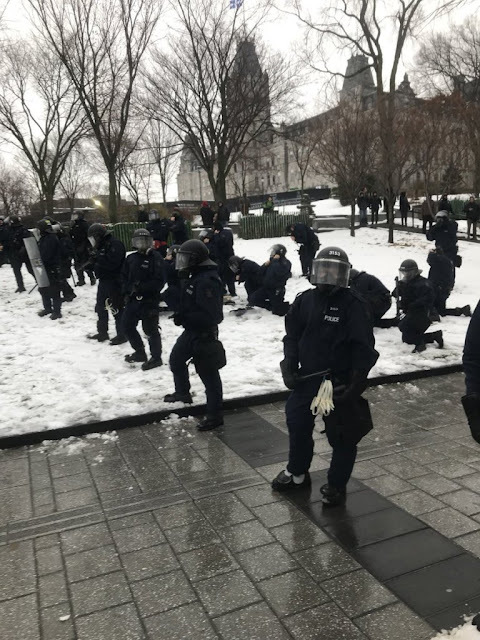 Outside the convention centre, police in riot gear placed themselves between the far-right groups and the counter-protesters. 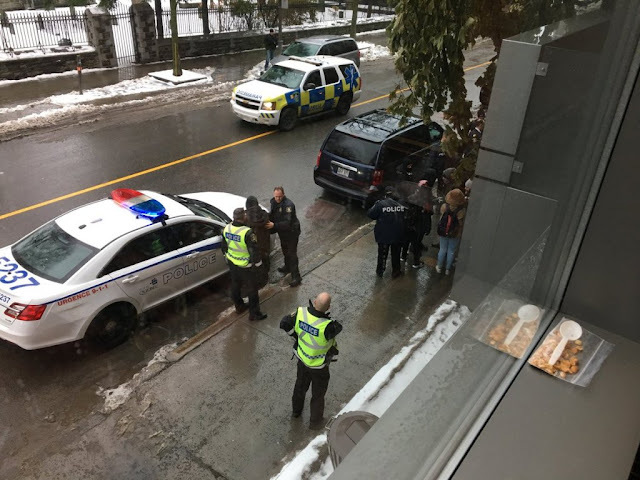 The doors of the convention centre were locked. 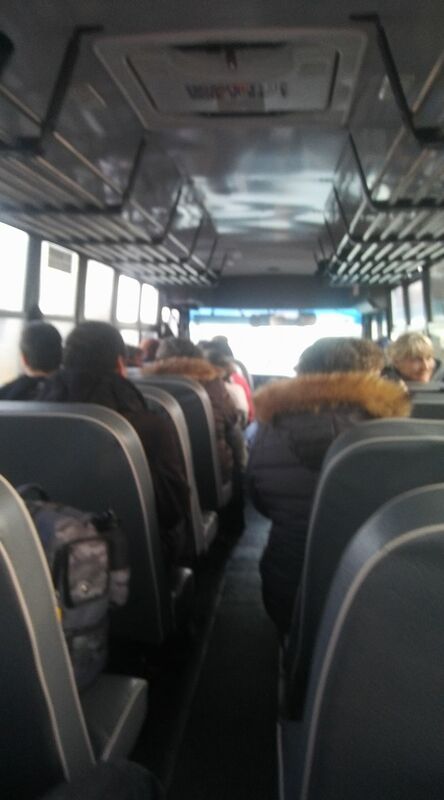 Police say around 20 people were detained. 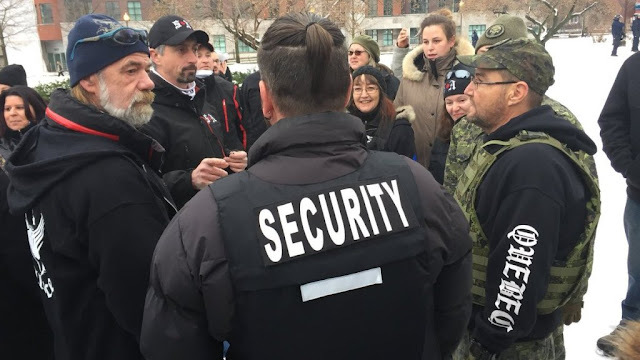 The far-right groups organized their own security for the protest. 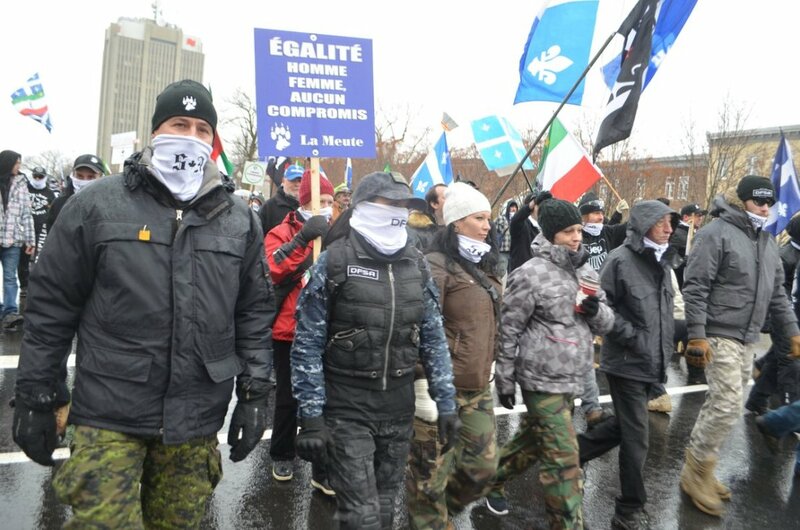 Members of the Three Per Cent — which fashions itself as a militia — were spotted wearing bullet proof vests and carrying billy clubs. 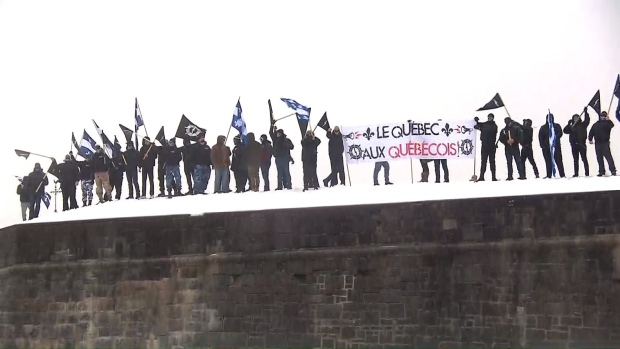 Atalante Québec, among the most extreme far-right groups in the province, unfurled a banner reading "Le Quebec aux Québécois," or Quebec for Quebecers. As the demonstration is presently underway, a quick report on the situation. A gathering angainst racism was held in front of the National Assembly, with speakers, chants and a very festive mood. Meanwhile, the Far-right La Meute and Storm Alliance, together with the Front Patriotique du Quebec, and members of the III% Militia and Northern Guard, gathered under very heavy police protection. The Far-right is less than 400 or so, a far cry from their goal of 1,000. The antiracist march is still underway with approximatelly 400 people. 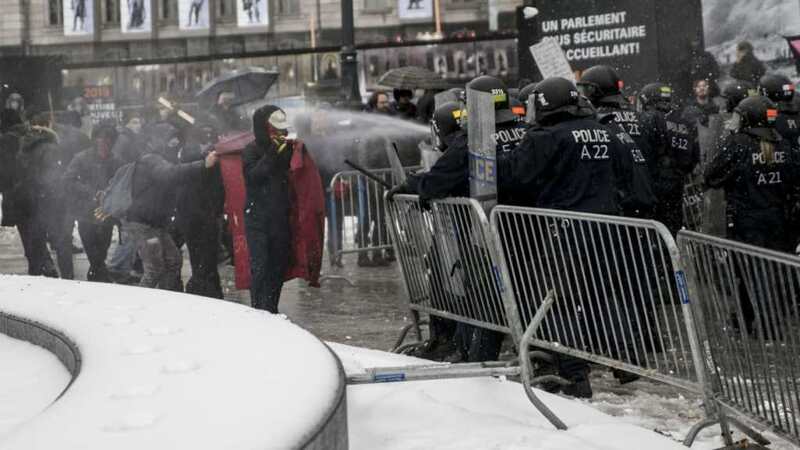 Police used tear gas against antiracists while growing the number of their forces to protect the Far-right. 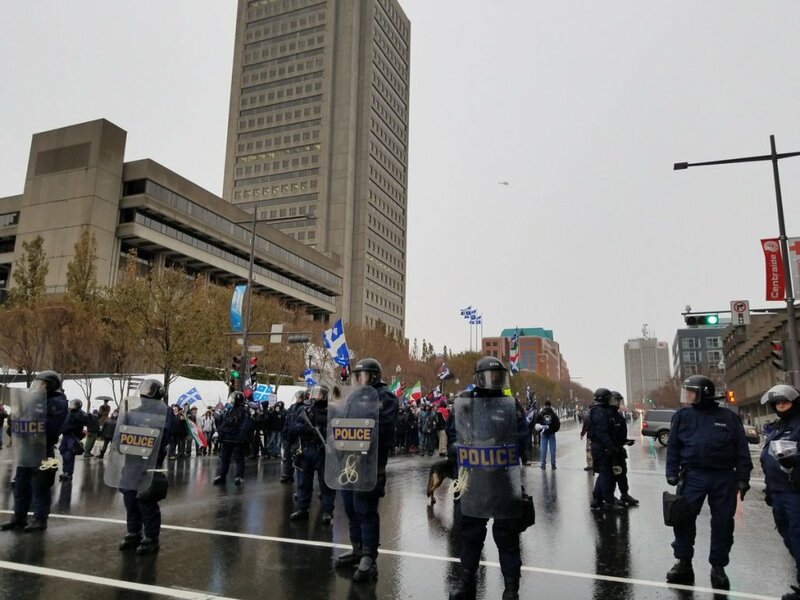 A tense moment just happened when 30-40 members of the neo-nazis ATALANTE, with the Federation des Quebecois de Souche arrived behind the antiracist march. At present, the Far-right are hold up in front of the National Assembly while some incidents seems to take place nearby, where ATALANTE and the FQS were hiding trying to set-up a trap against antiracists. I read Montreal cops used tear gas on counter protesters today. Meanwhile in London Pegida Canada also enjoyed heavy police protection, once again counter protesters were interfered with. Cops formed a wide perimeter around them this time. 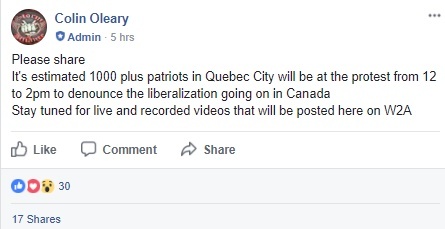 Video is on Pegida's FB page. 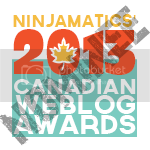 It's starting to look like we need an article about police behaviour at hate rallies in Canada. It's something that needs to be brought to the news media's attention as well. Cops across Canada are deliberately taking on the role of stormtroopers for neo-Nazis and hate groups. Doesn't sound much like "sunny ways" to me. If I were an immigrant I'd be worried about this. 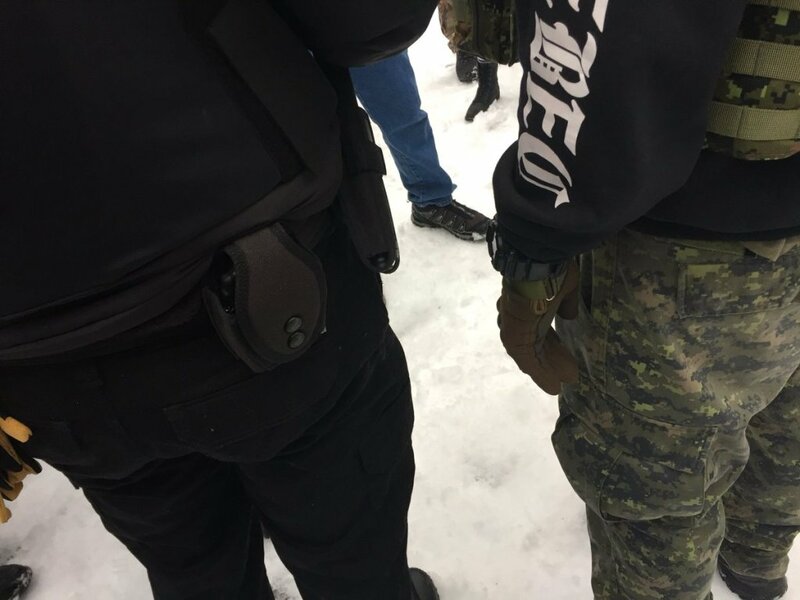 "[Police spokesman] Turcotte said his force had extensive conversations with members of La Meute ahead of the protest to help their own planning. 'We had a very good collaboration with La Meute. They told us their intentions, their itinerary, where they were headed,' he said. 'The other group [the counter-demonstration] told us they were gathering in front of the National Assembly. 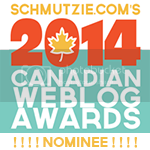 But we didn't have the same frequency of discussion with them.'" Of course they didn't, they were too busy colluding with the white supremacists. During a Calgary hate rally, the Cops allowed the Nazis to carry weapons like stun canes out in the open. 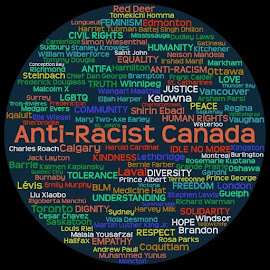 It's happening across Canada - Toronto in October (and before), Montreal (pics of the III% openly carrying pepper spray and stun batons in this blog) and London Ontario (three monthly Pegida hate rallies in a row, III% providing "security"). Collusion with the far right, including before the rally itself, turning a blind eye to an illegal private militia (treason), illegal weapons, assault, hate speech, incitement to hate, incitement to violence and the list goes on. Since when are cops paid to assist criminals and harass, assault and falsely arrest innocent people? 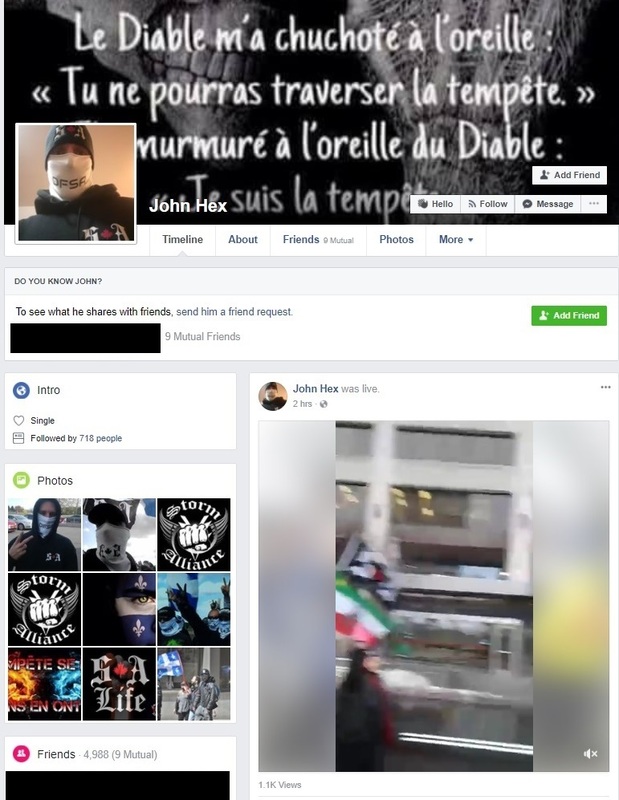 Here's a question: given the alt right's open, direct threats of violence against Trudeau and calls to overthrow the government (see screenshots here), why aren't RCMP or CSIS monitoring these dangerous kooks? Or are THEY colluding with them too?